For years economists and policymakers in the United State have been expressing fears that America would enter a Japanese-style deflation and thereby experience a lost decade like Japan in the 1990s. One of the earliest examples was the October 1999 Woodstock Vermont conference (later published in the Journal of Money Credit and Banking) on how to avoid deflation, which may have been an impetus to the Fed’s decision to hold interest rates so low in the period from 2003-2005. In his recently published history of the Federal Reserve Volume 2, Allan Meltzer reports, based on conversations at the time, that “Chairman Alan Greenspan believed and said that the country faced risk of deflation” during this period. Concerns about deflation are clearly on the minds of members of the FOMC as they meet next week. It was therefore very helpful and quite refreshing that Bank of Japan Governor Masaaki Shirakawa’s chose to address this issue in a speech this week at the Bank of Japan, Uniqueness or Similarity? 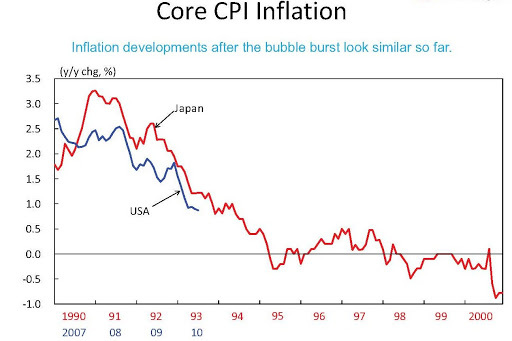 Japan’s Post-Bubble experience in Monetary Policy Studies. Hearing from a person in a top leadership position who can reflect on the experience of dealing with deflation is very useful right now. I heard the speech in person and can report that many in the audience (including me) were very positive about the interesting ideas, the clarity of the exposition, and the many helpful charts. The most discussed chart, reproduced here, suggested an eerie similarity between the United States and Japan.